This is the full and detailed views of the dust cover for the large print hardback edition of Finding Moon. This edition was published in 1996 by Thorndike Press in Thorndike, Maine. Design and Photography Credits: The cover was designed by Peter Thorpe. The cover features a narrow-necked handled ceramic jar with the image of a Asian inspired blue dragon head in the center. There are the bones of a human surrounding. Additionally, placed next to the jar is the lid. These images are reflective of a character who is supposedly searching for ancestral remains. This edition has front and back fold-outs. 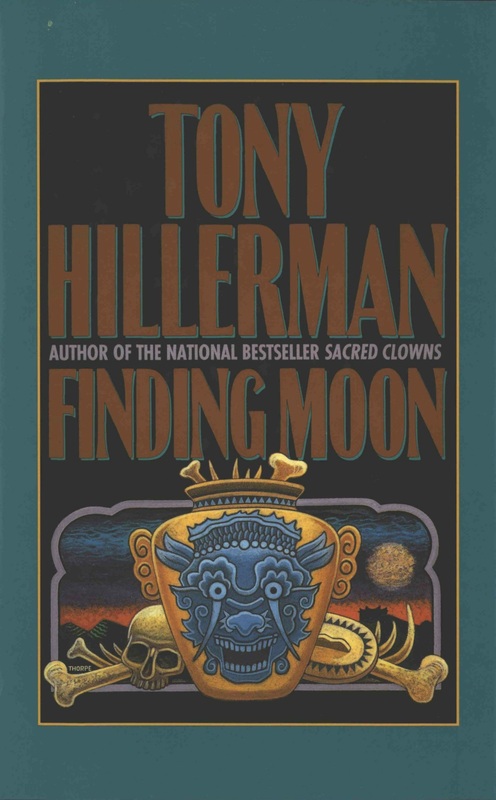 The front fold-out contains part of the synopsis of the novel and the back fold-out contains the remainder of the synopsis, a brief biography of Tony Hillerman, and literary praises for Hillerman.